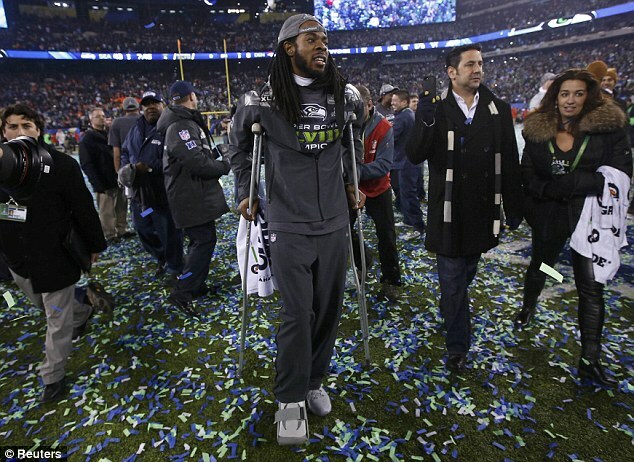 Seahawk’s star cornerback, Richard Sherman, had to leave the Super Bowl game a little early last night after sustaining an injury to his ankle during the 4th quarter. Earlier in the game, Sherman sustained an injury to the same ankle but with the help of his trainers returned to the game without any set backs. During the 4th quarter injury, however, his trainers felt it was unnecessary to return to the blow-out game and advised Sherman to sit back and watch his team’s final minutes at the sidelines. Later on in the evening, it was revealed Sherman sustained a high ankle sprain without any sign of an ankle break on the xrays. He was placed in a walking boot with crutches and is expected to have an uneventful recovery. A high ankle sprain is an injury to the syndesmotic ligament that holds the tibia and fibula leg bones together. High ankle sprains are more commonly noted in athletes because of the high velocity occurring while they twist their ankle or leg during games. More common ankle sprains among the regular population occur on the outside ankle ligaments called the lateral collateral ligaments. Most ankle sprains can be treated with immobilization, rest, and therapy. Very rarely do ankle sprains need surgical repair. If you are suffering from an ankle sprain or have developed pain or instability from a history of ankle sprains, then call Advanced Podiatry at 813-875-0555 for an appointment. Our doctors are fully trained to provide the necessary tools and treatment to help you with you ankle pain today!